Bromo Madakaripura Waterfall Tour 2 Days 1 Night -It is unfortunate if a visit to Mount Bromo without visiting other attractions in the vicinity. One of the beautiful waterfalls hidden in Probolingo is Madakaripura Waterfall.You can find the location of the madakaripura waterfall in the direction of Mount Bromo from Surabaya or Malang via Probolinggo. Only a short time for 2 days 1 night to Surabaya your can at once visit both the tourist attractions of Mount Bromo and Madakaripura Waterfall. Tour to Surabaya Mount Bromo for 2 days 1 night is very possible to add to visit the Madakaripura waterfall because the location of this waterfall is not far from Bromo. 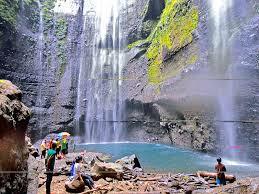 Madakaripura is the highest waterfall on the island of Java and is highly recommended for your visit. Surabaya to Mount Bromo Madakaripura Waterfall Tour 2 Days 1 Night, Arriving in Surabaya and interested in visiting Mount Bromo with a combination of Madakaripura Waterfall Tour for 2 days 1 night, Surabayabromotour.com is the recommended company for this tour with departure from Surabaya Airport / station etc. Our staff will pick up participant in Surabaya airport, train station or hotel then drive directly to lumbang village probolinggo for visiting madakaripura waterfall with durations trip to madakaripura from surabaya around 3 hours driving with the car standart tourism. Arrive in Lumbang Village Probolinggo you could free enjoying Madaripura waterfall. After satisfied for visit madakaripura, then continue drive to Bromo Hotel for check in and stay overnight. Free program. Tour program started from hotel. Participants will picked up jeep 4WD for take view sunrise bromo in penanjakan peak 1 the best location to enjoy the sunrise and view a row of mount bromo,mount batok and semeru peak . After finish enjoying sunrise,participant go back to the jeep and will delivered to the slopes of Mount Bromo by crossing the ocean of sand. Arrive in sea of sand (parking area jeep) and then you could climb or rent a horse toward the stairs slopes of Mount Bromo by following the up leading to the peak of Mount Bromo and view the crater of mount bromo. Around at 08.00 – 09.00 am back to parking area jeep and the jeep will drive you back to the hotel for having breakfast,showering, and loading your bags and then you will be drop off back to Surabaya or Malang. After arrival in Surabaya or Malang airport,train station,hotel, end our services for Mount Bromo Madakaripura Tour Package 2 days 1 night. Mount Bromo Tour and Madakaripura Waterfall is a blend of natural attractions in Bromo Semeru Tengger National Park. Madakaripura Waterfall strongly associated with the history of the kingdom of Majapahit in particular “Patih Gajah Mada”.